Tired of doubting yourself or feeling like a failure? 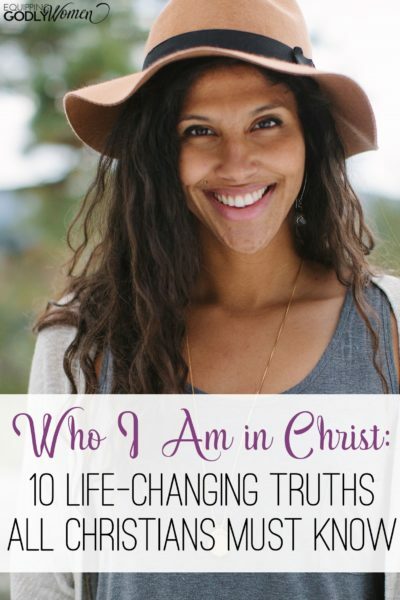 Check out these 10 “Who I Am in Christ” statements for a new perspective! A few weeks ago, my son mentioned to me that a few boys were picking on him at recess. Apparently they were calling him names, and it made him sad. As his momma, I hate that he has to go through that. But I also realize that it’s a part of growing up, and that it’s my job as his momma — not to take all the bullies away — but to teach him how to deal with them appropriately. Of course, as grown ups, it’s fairly easy for us to know when other people are being bullies to us and we shouldn’t listen. But what if the bully isn’t outside of us, but inside of us? After all, in my experience, the MEANEST people most women encounter these days are themselves. In that article, I shared tons of examples of lies women tell themselves all the time, before going on to explain exactly how to take those lies captive and replace them with the truth of Christ. I bet you’ll recognize some of those lies in your own life as well. But there’s just one problem… in order to replace negative thoughts with the truth about who you are in Christ — you have to know what it is! Getting in the habit of reading your Bible regularly and learning how to study your Bible for yourself are the two BEST ways to do this. But today I thought I’d get you started off with 10 very powerful “Who I Am in Christ” statements to get you thinking. Because, remember, we don’t listen to mean, wrong bullies–even when those bullies are ourselves. Instead we ask ourselves “Who does God say I am?” or “What does God say about me?” because it isn’t what the world says about us that matters. It’s what God says about who I am in Christ that matters. And knowing who we are in Christ–really knowing–and finding our identity in him? That changes everything. And yet, how easy is it to forget or question this basic truth about our identity in Christ? The God of the entire universe LOVES you! He DELIGHTS in you! He REJOICES over you with singing! (Zeph 3:17) He doesn’t want to harm you. (Jer 29:11) He came so that you might have a life that’s full and abundant! (John 10:10) That’s good news! Have you ever felt left out, abandoned or unwanted? Not with God! God chose you before the beginning of the world (Eph 1:4). He formed you before you were born (Psalm 139:13), and He has called you for a specific purpose. (2 Tim 1:9) You are not an accident, and you are not here by mistake! This is one “Who I Am in Christ” statement you won’t want to forget! Do you have a sinful past that makes you feel ashamed? Not anymore. According to Christ, you are a brand new creation. Our old self is crucified with him (Romans 6:6); now we put on our new self and a new identity in Christ, which is continually being renewed (Col 3:10). The labels that once defined you are completely stripped of any power over you. Every day is a new day. You can start fresh TODAY. Are you constantly beating yourself up because you’re not skinny enough, smart enough, talented enough, young enough, or any other “enough?” Enough! Your identity is no longer rooted in your past — your identity is in Christ and Romans 8:1 tells us there is NO condemnation for those who are in Christ Jesus. You are not allowed to beat yourself any longer and satan isn’t allowed to either. You’re forgiven, remember? You’re brand new! Don’t think you can do it? God thinks you can. Romans 8:37 tells us that we are MORE than conquerors. Philippians 4:13 tells us we can do ALL things through Christ who gives us strength. And 1 Corinthians 15:57 reminds us that God gives us the victory! Whatever circumstances you’re facing today are NOT too much for you to handle. Not with Christ anyways. When you’re on God’s team, you’re ALWAYS on the winning side. This is one of my favorite “Who I Am in Christ” statements because it’s just SO powerful! Don’t feel special enough? You should! You are God’s handiwork! He made you. He created you exactly the way He wants you. He LOVES you! And God doesn’t make mistakes. Nor does He have bad taste. He knew exactly what He was doing when He created you! Of course, just because God made us doesn’t mean that any of us are perfect (unfortunately….). But the good news is — God isn’t done with us yet! God doesn’t just leave us in our sin. He sanctifies us and makes us holy (1 Corinthians 6:11). He works on our hearts more and more every day. Worried how you’ll make ends meet? Don’t be. The Bible promises us over and over again that God will meet all of our needs (Philippians 4:19). After all, if God takes care of the birds and flowers, won’t He also take care of us as well, His children? (Luke 12:28) Just because you don’t know HOW God will work things out yet doesn’t mean that He won’t! The battle may not be over, but the winner has already been decided. You are victorious! Looking for even more “Who I Am in Christ” statements to encourage and inspire you? Be sure to check out these Bible verses about who you are in Christ. Do you ever struggle to believe any of these “Who I Am in Christ” statements? Which ones? How would your life change if you based your self-worth on God’s view of you, not the world’s view of you? Thank you for sharing this positive post. I really enjoyed reading it and instantly felt uplifted and cared for by God. Aww, so happy to hear that, Anna! Thanks, Angela! Hope your kids have a great start to the year! I love to keep reading those verses that affirm who I am in Christ. It’s so easy to let ourselves be carried away by the comments and thoughts of others about us. But you’re so right! The comments and thoughts of mean, wrong bullies don’t matter because they’re just flat out lies! The truth is always what God says about us. 3. WHAT are you seeking? 4. WHY are you afraid? The answer to the second question has to become “God did”. If we’re still replying “So and so did”… it’s because it’s not true! We ARE where God tells us we ARE in life. Not where mean, wrong bullies tell us we are. The fifth question is: How much more of the Holy Spirit would your Father in Heaven give you if you asked? So much more! So much more! I love Beth Moore and her studies. The Quest was so encouraging and inspiring. I love your post. Thanks for always encouraging and empowering us! This is beautiful and so true, thanks for sharing this amazing post! This is such a straight forward way of explaining who we are in Christ. Thank you. I’ve shared the link on my blog!